The stylehounds are in Cheltenham today seeking out the best design and style that Cheltenham has for theoldmortuary.design. Sausage refuelling required at Baker and Graze following early morning architecture trail . 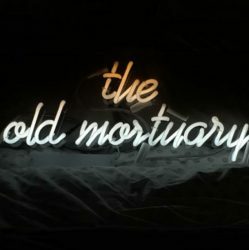 theoldmortuary. design has long existed in my mind. Blogging about it is one of the first steps to making it real. Intended as a gathering point for all things creative, it is both a real bricks and mortar place and a notional place of thoughts and creations. As creative projects mature into tangible objects they will be showcased here. Daily blogging will give me the chance to record and comment on the things that inspire or impress me. The image above of Battersea Power station is a record of a moment. Commuting into Victoria every day there were often fabulous photo opportunities with this powerful architecture. However they were often obscured by other trains. This was a moment when I was heavy-lidded from a period of 24 hour on-call. Thankfully my iPhone captured a rare moment of quiet. This image is precious because development has obscured this beautiful silhouette forever.